That latest technological marvel. It seems to be sweeping the nation, quite literally, but is it a fad or a trend with lasting staying power? Read on and find out how you can spot the differences between the fads that wow you and the trends you won’t want to miss out on! 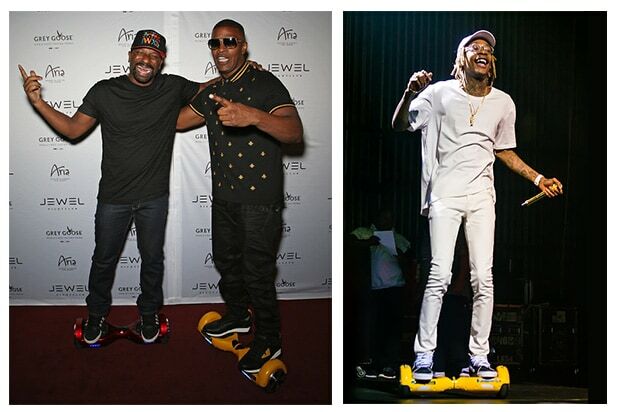 The dominant consumer product of the 2015 holiday season was?- the hover board. This fantastic, futuristic piece of the 21st Century — personal transportation meets consumer electronics, meets extreme sports — was all over the news. It was a must-have gift of the season. Six months later, hoverboards were off the radar, and sales had cratered. Roombas and other robotic vacuum cleaners were emphatically not the dominant consumer product of the 2015 holiday season — at least when it came to public attention. They were simply selling steadily in ever-increasing volume, just as they’d been doing for years. Although robotic vacuums look superficially like hoverboards — both are novel, technology-based luxury items — there are significant differences. Steady growth in robotic vacuums reflects their greater utility and the fact that they meet an actual need — helping consumers keep their floors clean without their having to take time to do the vacuuming. To put it another way: Hoverboards were a fad while robotic vacuum cleaners are the trend. To make smart decisions about investments, mergers, acquisitions and project development, itís critical to know the difference. Every year, a handful of consumer products become runaway hits. They seem to come out of nowhere. They’re hyped by traditional and social media. Demand surges and retailers can’t seem to keep them in stock. Revenues ramp spectacularly. Sometimes, that success persists for a while — for a year, two, three, perhaps even four. And then they simply fade — or vanish suddenly. Sometimes the companies that produced them vanish, too. Or perhaps they survive — but at dramatically lower levels of revenue, profitability and attention. The initial attention is so extreme that it’s easy to remember the products. Who can forget the popularity of Pet Rocks, Beanie Babies, the Atkins Diet, in-line roller skates, and paintball arenas?- the list goes on. PokÈmon Go might be the next on the list. These products help define their moment. Twenty years from now they might be still be out there, selling quietly in a low volume, steady state. Or they might simply be flashpoints for nostalgia. What they aren’t is a sustainable business success. and consistently growing market. Their revenue stream is predictable and is likely to persist well into the future. The first set of products are fads. The second are trends. The distinction between them matters. But telling them apart isn’t easy. Our examples make the differences seem obvious, and indeed they are — after the fact. The challenge for investors or decision-makers is to spot potential fads when the product is still under development. 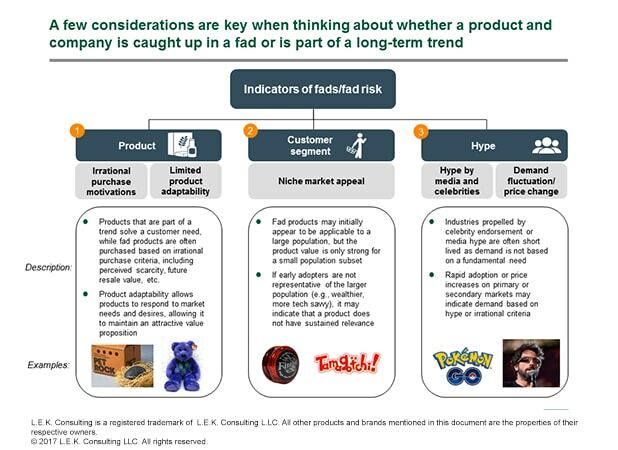 Understanding and characterizing fads — and distinguishing them from trends — is crucial to investment strategy and revenue projection across industries, from technology to toys to consumer services. * A fad is an intense and widely shared enthusiasm for something, especially an enthusiasm that is short-lived and without basis in the object’s qualities. It is typically characterized by a two- to four-year revenue ramp, often accompanied by price inflation in secondary markets, followed by rapid decline once the fad “bubble” bursts. * A trend is a general direction in which the market is developing or changing. Trends offer steady revenue growth — they point the way toward attractive target markets, high returns and steady revenue growth. There’s nothing inherently wrong with fads. They can generate substantial revenue and ROI. That’s fine, as long as it’s what the business and the investors are expecting. The problem is one of surprise — investing in a fad while believing it’s a trend, then being unprepared for the sudden, sharp decline. In Figure 1, we outline a systematic way to review your projects and investment targets and spot potential fads. There are three categories to review, and one or more factors in each. category — in the case of a beauty product, you’d want to look at the role of celebrity endorsements in making it so popular; in the case of a toy, you’ll want to know whether it’s selling for high multiples on eBay or reseller sites, mainly for novelty. You’ll probably want to step back, look at the overall picture and ask whether, all things considered, the product leans more toward fad or trend. In the end, the framework exists to help guide the hard work youíll have to do — observing the marketplace, talking with consumers, listening to them and watching their behaviors. o Limited product adaptability. Trend products are adaptable to market needs and desires. Exercise clothing can be adapted easily as new forms of exercise become popular. But how adaptable is a Pet Rock? * The consumer segment. Look at the consumer base for warning signs. o Niche market product, unsustainable mass-market reach. A fad product is often a niche product that briefly has mass-market appeal, or carries mass-market expectations that canít be met. There’s nothing wrong with a niche product — some people will always want to play paintball or laser tag. But initial dramatic sales levels beyond the niche may signal a fad in the making — a bubble that canít be sustained. Or expectations can be off target. Google Glass provided constant access to computing — a major draw for a small group of technologists. But the media and others who expected it to become a mass-market product were sharply disappointed. What Google Glass had to offer was not of interest to anyone else, especially given the price and the availability of solutions such as the smartphone that met a similar consumer need. o Hype by media and celebrities. Media hype and celebrity endorsement propel the demand. The mediaís summer 2016 obsession with PokÈmon Go is a case in point — media coverage drove rapid uptake, but daily user levels dropped sharply as consumers quickly lost interest. Celebrities like Madonna helped drive interest in the oxygen facial — but only for a short time. o Demand fluctuation and sharp price changes. Hype drives demand (and therefore prices) to extreme levels. But neither demand nor pricing signals long-term interest in the product. Neither is sustainable. Compare and contrast these fads and trends to sharpen your own recognition skills! Then, come back next week for part 2 of this multi-part primer on Fads and Trends where we will delve deeper into the differences of these two similar, yet distinct product descriptions and what a business needs to do to assure steady performance and develop a solid long-term strategy. Robert Haslehurst is a Managing Director and Partner in L.E.K. Consulting’s Boston office and is focused within our Retail and Consumer Products practices. He has been with L.E.K. since 2000 and has extensive experience working with both retailers and consumer brands in the U.S. and globally. Robert also has significant experience in other consumer-facing industries, notably media, travel, automotive and technology. He advises clients on a range of issues, including corporate strategy, consumer insights, new product development, program management, corporate finance, and mergers and acquisitions. Robert received his Master of Business Administration with High Distinction from the Tuck School of Business at Dartmouth College, and holds a Master of Electrical and Electronic Engineering (First Class Honors) from Imperial College London. Maria Steingoltz is a Managing Director and Partner in L.E.K. Consulting’s Chicago office. She joined L.E.K. in 2003 as an Associate and works in the retail consumer sector with a special focus in food and beverage as well as beauty and personal care. Maria advises clients on a range of critical strategic issues, including growth strategy, international expansion, pricing, and mergers & acquisitions. In 2014, she was selected as a Rising Star of the Consulting Profession by Consulting Magazine. Maria holds a Bachelor of Arts degree in Economics and Mathematical Methods in the Social Sciences from Northwestern University. She also received a Masters in Business Administration from the Kellogg School of Management and returned to L.E.K. as a Consultant in the Chicago office. This is Part 1 in a series by Rob Haslehurst, Maria Steingoltz and Dan Schechter from L.E.K. Consulting’s Media & Entertainment practice.